Diatomaceous ("dahy-uh-tuh-mey-shuhs") Earth is composed of the fossilized exoskeletons of tiny single-celled, micro-organisms called diatoms. When these organisms died, their skeletal remains settled to the bottom of large bodies of water and became fossilized. It is the fossilized exoskeletons of these diatoms that create diatomaceous earth. 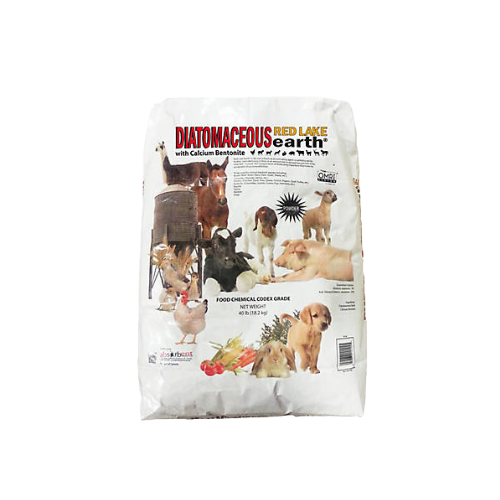 Red Lake Earth® is a unique blend of Diatomaceous Earth and Calcium Montmorillonite (also known as calcium bentonite). Meets both Food and Feed Grade specifications. Approved for use in animal feed as a pelleting aid or anticaking agent for further manufacturing in feed (amount not to exceed 2% percent of total diet). Improves the flowability and mixability of all types of animal feed. OMRI Listed (Organic Materials Review Institute) for use in Organic Production. Approved by EPA for use as a natural insecticide. Powder Formula. To be used for various livestock species including Bison, Cattle, Goats, Sheep, Equines, Alpacas, Llamas, Poultry, Swine, Rabbits and dogs. In an amount not to exceed two percent of the total diet.